Buzz and Sheldon are brothers in their eighties who have been estranged for decades. Buzz visits Sheldon to see if there's still a relationship left to salvage. This is Jonathan Goldstein's new podcast. They released two episodes at once. I thought this was the better of the two, but I enjoyed both. I always love Jonathan Goldstein's stories for This American Life. I subscribed to Wiretap for a while as well, and it was sometimes amazing but often annoying (too much of Jonathan Goldstein and his friends' schtick). 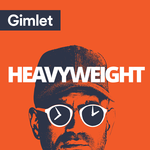 So far I like this podcast (I also Buzz is up there with his best This American Life stories, and I enjoyed the second episode as well), but I hope it doesn't suffer the same fate. I am interested to see where this show goes. I heard a preview version of the episode about Moby (Gimlet member perk) a little while ago. I thought that episode had a little more tension. This was definitely a nice story. Interesting how Buzz thought his mom favored Sheldon when perhaps she was protecting him.